A spring training battle which captivated Padres fans and national media alike was the contest between Austin Hedges and Francisco Mejia to be the starting catcher to begin 2019. While Andy Green has insisted that he will employ a “catcher by committee” strategy, playtime and performance suggest that Austin Hedges is winning this race. 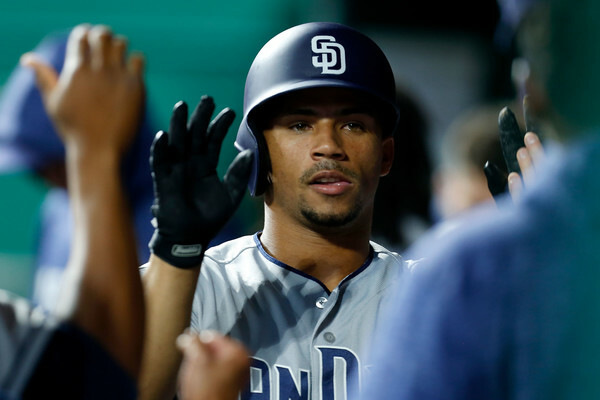 For a position that has been starved for offensive production across the league, the Padres’ catching duo provides an envious amount of depth. Hedges, whose ability to hit for average has been a disappointment thus far at the major league level, hit an impressive .282/.391/.615 with four HR and 13 RBI this spring. Meanwhile, Mejia did everything in his power to earn the starting spot this spring, hitting 354/.380/.625 with three HR and 14 RBI. These two slash lines couldn’t have been more similar. Thus, Andy Green opted for Hedges, the more experienced and defensively reliable of the two, to start on opening day. This decision proved to be the correct one as Hedges was able to help guide opening day starter Eric Lauer to an opening day victory. While both catchers have put up comparable offensive numbers through the first week of the season, it’s their defense and pitch calling ability that has separated the two. For instance, besides Matt Strahm’s disastrous first start of the year, every game Hedges has caught has resulted in both a victory and one earned run or less from our starting pitchers. In comparison, both games Mejia has caught thus far has produced in over three earned runs and losses. Most notably, in the Padres loss to the Diamondbacks on Tuesday, Zack Greinke stepped into the batters box against pitcher Eric Lauer with two outs, and two runners on in the fourth inning. Greinke, who’s no slouch at the plate, stood ready to receive Lauer’s two-strike pitch. With the preservation of their 2-1 lead seemingly secured, Lauer’s slider entered the strike zone only to be mishandled by Mejia behind the plate. What would have been strike three, inning over, was now called a ball. Tough luck for Lauer and Mejia. Instead of being back in the dugout munching on sunflower seeds and checking scouting reports, both remained on the mound and behind the plate in an extended at-bat with Greinke. Moments later, Lauer’s delivery would be crushed by Greinke to the left-field seats. A three-run home run by the pitcher. A 4-2 lead for the Diamondbacks- both of which would have been avoided if Mejia had caught what was a strike. Sure, mistakes are bound to happen throughout a lengthy 162-game-season. However, this event serves as a valid representation of how pitch framing can be the difference between a win and a loss. 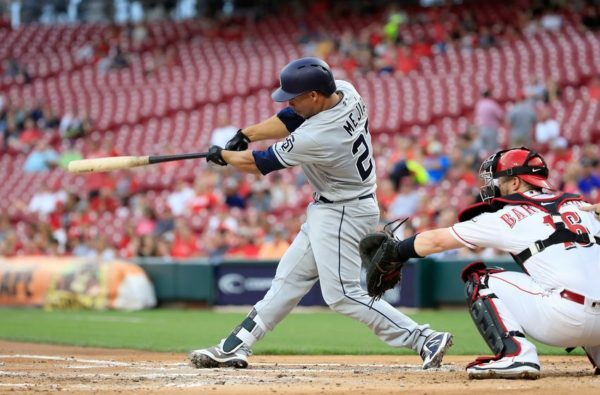 Last season, Hedges 12.0 pitch framing rate (FRM) made him the sixth most effective pitch framer in baseball. Meanwhile, Mejia’s -1.2 (FRM) in limited innings in 2018 made him a below average pitch receiver. Even in the minor leagues, Mejia has been much more highly touted for his offense rather than his defense, which has always been seen as league average. And since the Padres have the youngest and most inexperienced rotation in baseball, it will be essential to have a great defensive catcher behind the plate to guide and develop the staff. Regardless, Hedges has logged hundreds of more innings at the major league level than Mejia. And with hundreds of innings remaining in the 2019 season, Mejia will have ample opportunities to improve his defensive metrics. 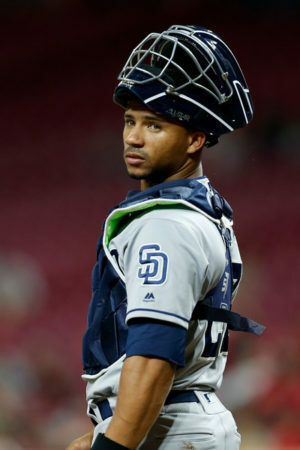 Thus, it will be necessary for Andy Green not to jump to conclusions by cutting Mejia’s playing time drastically. Instead, the Padres must keep tabs on this emerging trend and allocate innings accordingly. This article is totally fabricated. The Grienke home run off of Lauer occurred with ONE Freaking out, and on an 0-1 COUNT!! I know that people around here. Treat a 3rd tier catcher like “Hedgy” as if he is the 2nd coming of Jim Sunberg. But you should at least get your BS straight! Jim Sunberg?! Wow, impressive reference. I’d rather have a top 10 closer (on a very team-friendly contract) than a back up catcher who catches 30 games. They’re not winning anything this year. So Hand isn’t leading them to the promised land. They will need Mejia to hit in the three years beyond this one, since they are stuck with bad contracts in Myers, and Hosmer. Those two overpaid mediocre talents, will limit them from signing Mookie Betts (should he become a FA), or George Springer, along with a front line pitcher in free agency. At this point the development options are limited to Mejia, Reyes, and Urias. Renfroe profiles more as a poor man’s Pat Burrell, so I am kind of thinking he’s out of the running. If Mejia is Tony Pena like, that’s a very good offensive catcher. Someone has to be the backup catcher, let it be Mejia. But no way he should catch more than 30-35 games. It is interesting to think about: Brad Hand might be FAR more valuable to the Padres now than Mejia. On the open market (trade-wise) Hand would likely fetch far more than Mejia, although I doubt many would admit this.